KING HENRY AND THE SHOWMEN! King Henry & The Showmen had been together for over 50 years, and have a long list of accomplishments since their beginning. ● Recipients of numerous awards. ● Sold out concert in Carnegie Hall. ● Over 100 shows at the MGM Grand in Las Vegas. ● Recorded over 30 different albums and CD’s. ● Appearances at major hotels from Toronto, Canada to Miami Beach, Florida. Henry Casella is the organizer and leader of the group. Upon graduating from college, Henry began his professional career by playing drums for Bobby Darin. A year later, Henry formed his own band, The Showmen. A local agent, Lou Reda, suggested the name King Henry, and so the band came to be known as King Henry & The Showmen. 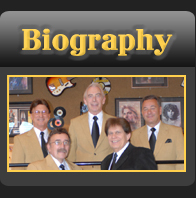 The band’s big break came in 1965 when they became the house band at Mount Airy Lodge, which at that time was rated as one of America’s leading resorts. It was there where the band developed their sound and unique showmanship. King Henry & The Showmen performed at Mount Airy for 20 years, working with scores of celebrities, such as Tony Bennett, Jerry Lewis, and the Four Seasons. Appearing at Mount Airy helped the band to acquire hundreds of fans from New Jersey and New York, and lead to being asked to perform in Carnegie Hall. Their sold-out concert there resulted in offers to perform at casinos and nightclubs around the country. Upon leaving Mount Airy Lodge in 1985, the band accepted some of these offers, before settling at their new Pocono home base, Tamiment Resort, a hotel that was owned by Wayne Newton. The band performed there for 7 years, until they moved to The Mountain Laurel Resort, where they appeared 6 nights a week. It was there when Henry decided to establish The Pocono Mountain Opry, a luncheon show that featured the band, and was geared towards senior motor coach tours. The Opry became an immediate success, and continued for many years at various venues in the Poconos. In 1995, Henry opened a second luncheon show event called The Fun Time Ragtime Follies in the quaint town of Jim Thorpe. This weekly show attracted as many as 11 motor coach tours at each show. In 2002, Henry moved all of his luncheon shows to Penn’s Peak, where the shows became a popular attraction. Also, in the same year, the band moved its home base from the Poconos back to the Lehigh Valley. In the past, the band has appeared in major nightclubs around the East, including Palumbos in Philadelphia, Holiday House in Pittsburg, and the Essex House in New York. 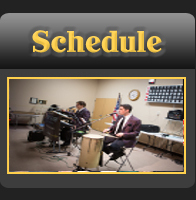 For the last 15 years, King Henry & The Showmen have decided to stay local and perform at some of the many area venues, including fairs and festivals, such as The Greater Allentown Fair, San Gennaro Festival, Mayfair, and the West End Fair. New York Magazine called King Henry & The Showmen “one of the best acts in the business”, mainly for their award-winning shows. The band is also known for their wide variety of dance music, and has answered requests to perform at local dances and nightclubs. However, the group has turned down invitations to perform at local casinos, since they had previously appeared at more prestigious and lucrative engagement at major casinos in Las Vegas and Atlantic City. Members of the group includes, Gary Dee (DiPasquale), a multi-talented entertainer who has been with the group since conception. Besides being the comedian of the group, Gary plays guitar and banjo. Frank Russo plays saxophone and has been an important part of the group for many years. He is constantly praised for his musicianship and creative solos. Rollin Krause is one of the best trumpet players in the area, and is an important part of the bands big sound. John Richetta has been the drummer with the group for the last 10 years. He is well known as the host of the popular radio program, Tempo Italiano, which is heard every Sunday morning in the Lehigh Valley. Although Henry has decided to disband the band, Henry will continue to perform with his grandson, Jacob, who is a talented singer/songwriter and a graduate of the School of Performing Arts. "King Henry is one of the best acts in the business."